I attended the Bloggers’ Party entitled “Cool Summer with Magnolia Frozen Delights!" which was held on April 1, 2011 at San Miguel Corporation head office in Ortigas Centre. There was an Audio Visual presentation which showcased their new manufacturing plant facilities in Sta Rosa, Laguna and introduced their products endorsers. The question and answer portion with Mr. Mayo, Magnolia's General Manager, gave us a glimpse on what directions the company is taking and provided us with Magnolia product updates. We were treated to a night of fun as Magnolia models introduced the five Frozen Delights: Popsies ( which retails at P11.00), Pinipig Crunch (P 13.00), Sweetie Bites (P 11.00), Fun Bar (P 10.00), and Spinner (P 20.00). I love the taste of the new Spinner. It has that rich, creamy, dairy goodness and much more! Magnolia ice cream is superbly a calcium powerhouse! The Velasco Brothers provided entertainment as they strut their way on the dancefloor. Aside from the dinner buffet, contest and raffle prizes, we were all given a package-full of frozen delights to take home! I love everything about ice cream, who doesn't? I am glad that the Magnolia brand I grew up with is back for good. 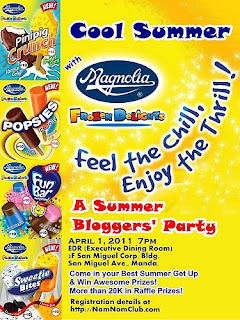 Indeed, it’s going to be an awesome cool summer for me with my favorite Magnolia Ice Cream Frozen Delights Pinipig Crunch!